Remember books? We do. That's why this log cabin bookcase is a rustic tribute to timeless works of literature. A large hardwood bookcase is strong enough to keep all your volumes safe. Store whatever you want in this versatile bookcase with a bottom cupboard. Craftsmen hand-select this eclectic wood to execute their sturdy workmanship with some artistic flair. Make your cottage a great place for reading or for anything else you do. Pictured in Rustic Alder with Natural finish. 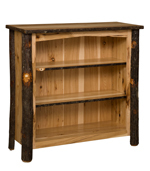 The Bearlodge Bookcase mixes rustic style with Mission elegance. Hickory logs and twigs contrast smooth hardwood, creating a bookcase that compliments a country room or adds dimension to an eclectic setting. The outdoor texture of this bookcase encourages you to relax and read. This grand bookcase is handrafted with Amish care to display both books and solid wood surfaces in a loving household. The twig detailing on the top, feet, and shelves, is subtle and gives this hand built bookcase a rustic elegance. A bookcase with no frills is a beauty to behold. This elegant bookcase lets your treasured books draw the attention. Sturdy mortise and tenon construction will hold heavy volumes for generations. Variety is the beauty of this age. That's why this simple bookcase has three shelves and a bottom cupboard to store everything you need. As an added bonus the doors better showcase the grain of this solid wood piece.